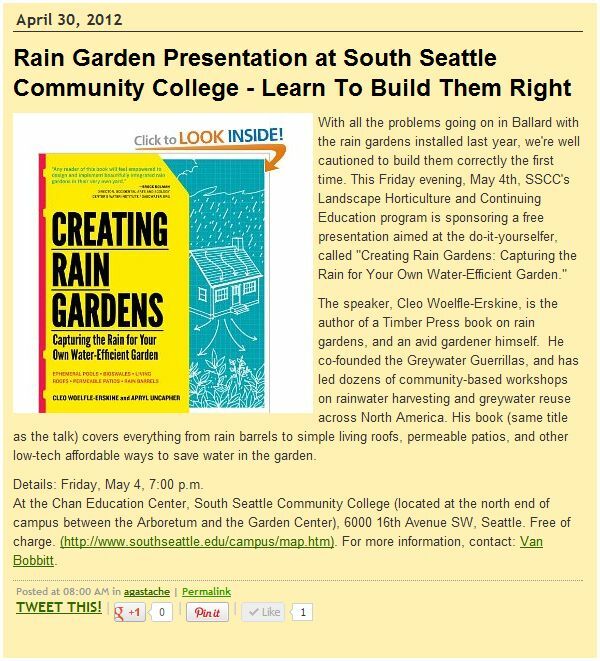 Creating Rain Gardens acknowledges the groundbreaking work by many in Washington State and the Pacific Northwest, and the importance of linking rain gardens to healthy watersheds that protect Puget Sound. Rain Dog Designs is pleased to have contributed a case study and photos for this handbook, published March 2012 by Timber Press. Order your copies from Timber Press or Amazon. Amazon has selected read ahead material. This banner from the Timber Press FaceBook page shows a Rain Dog Designs photo of a home along the 8th Ave Street of Green.